Combining fruit with your oven roasted chicken breast intensifies the flavour and creates a delicious entree. 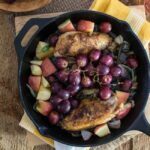 When you add a powerful herb like sage to the grapes and apples you have something so sublime you’ll already be planning when your next going to cook this delicious chicken entree. Wow, you guys, I love everything about this dish – it’s simplicity, the robust essence of the sweet and savory seasonings, the roasted juiciness of the fruit – it’s pure heaven! This represents exactly what I strive for in my cooking – healthy, real food that is easy to prepare and yet tastes as though you spent hours in the kitchen. The whole family will certainly enjoy this and be asking when you will be making it again! I am discovering more and more that we all tend to get stuck in our mundane ways of eating and some people find this dish adventurous (or even weird) because it combines meat and fruit. If you are one of those people, I encourage you to take that chance and try this because your palate will be giving you hell afterward and you’ll be wondering what took you so long! The apples and the grapes provide the natural sweetness that makes the entire dish juicy and full of delicious flavours. The sage in this dish is the key but I have seen recipes using thyme or rosemary as well. I initially saw this in The Food Lover’s Cleanse by Sara Dickerman but changed up the herbs and added some apples. The shallots are another essential ingredient that has made this my new favourite. I’ve cooked it twice more since initially making it because I just can’t get enough! I picked the apples up from the Barrie Hill Farms market in the Fall – check them out if you are in the area! Add these apple chunks to your oven roasted chicken breast recipe will be an addition you will never forget about when cooking with chicken! I left the skin on the chicken because I wanted it extra juicy but you can remove it before eating if you’re concerned about the calories. I also topped it with a delicious nut and spice mix I purchased from Glory Kitchen. It contains almonds, sun-dried tomatoes, aleppo pepper, garlic, basil, oregano and rosemary. 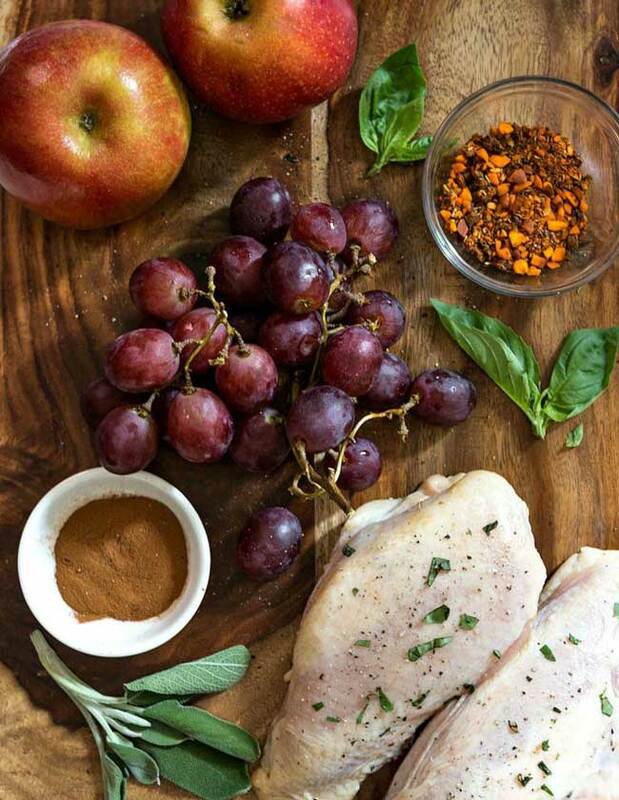 This oven roasted chicken breast recipe combines the best flavors with delicious fruit to make a healthy dinner for you and your family. I used apples and grapes, but you could substitute or add other fruits that suit you better. The combination of juicy fresh apples with delicious grapes is a nice combination and if you enjoy those fruits, you can’t really go wrong. Give it a try and let me know what you think! What other fruits could you use instead of grapes and apples? The oven roasted chicken breast when combined with the sweetness of the apples and grapes brings a sweet and delicious combination. Adding the herbs like sage give the dish more flavour that your taste buds can tolerate! Season the chicken on both sides with the five spice powder or cinnamon and sprinkle with salt and pepper. In a large oenproof skillet, heat the oil over medium high heat. Blot the chicken with paper towels and add the to the pan skin down; add the shallots. Cook the chicken undisturbed until brown and crisp; about 5-8 minutes depending on thickness. Turn the shallots frequently while the chicken cooks. Turn the breasts over and add the sage, apples and grapes. Add the vinegar and 1/4 cup of water to deglaze the skillet. Season with more salt and pepper. Transfer the pan to the oven and roast ntil the chicken is cooked through and the grapes just start to wrinkle, about 8 minutes. 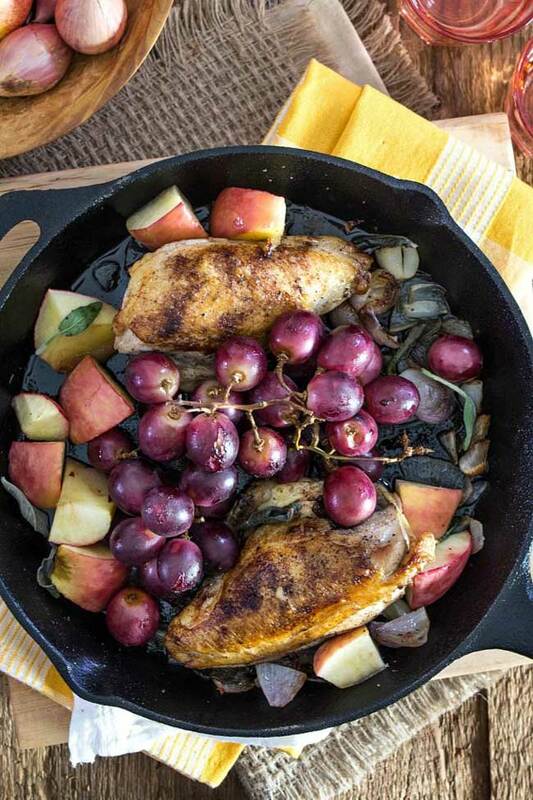 Serve the chicken with the roasted grapes, apples and shallots alongside and any pan juices spooned on top. have shared and cooked so many of your wonderful recipes – look forward to each season to see what you’ve posted. Thanks so much, Elizabeth! So glad to hear you’re enjoying them!